Postmarkapp.com to email photos to users. Select this option in Uploaders settings. New touch screen controls. 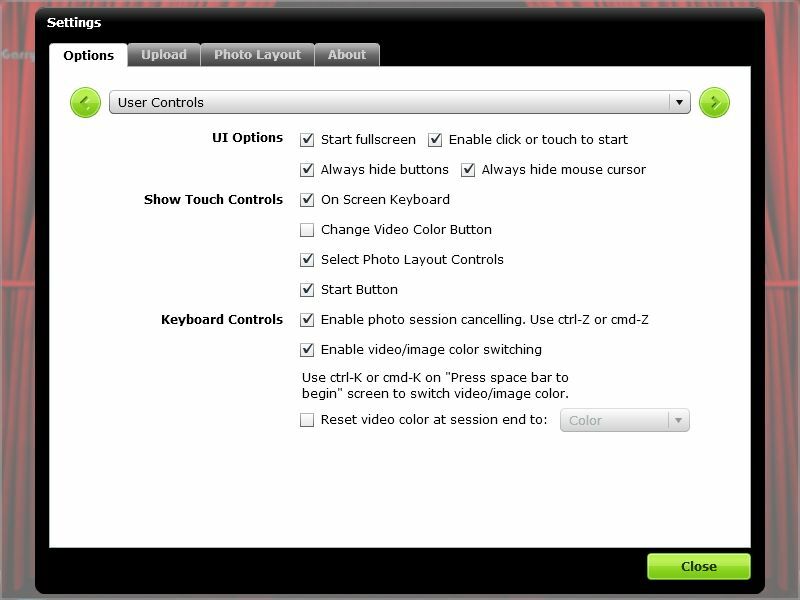 To enable, go to Settings > Options tab > User Controls. New on-screen keyboard used for user prompts. New on-screen photo layout selection and layout preview, so your users can now select the layout to use. Only layouts marked as "Favorite" will be displayed. Option to always hide mouse cursor. Useful for touch screen users. The new touch screen features work great with computers like the HP TouchSmart series. If you don’t have a touch screen computer, the new features also work with a mouse. This preview does not include the Canon camera or the native webcam features. These are still under development. This attached file still shows it's version as 2.6.3 so you can activate it if you have a Sparkbooth license. Please send me your feedback on this preview. John Wu closed this discussion on 17 Jul, 2011 10:19 PM. Added option to submit emails to MailChimp mailing lists. To turn on this option, go to Settings, select Option tab, select Saving from list and check the "Submit Email to MailChimp Mailing List" option. You will need to also select the Prompt for email option. John Wu closed this discussion on 21 Aug, 2011 08:52 PM. Update to new license key system. John Wu closed this discussion on 31 Aug, 2011 04:50 AM. I can actually zoom in with my logitech c910 HD pro webcam outside of the program. But I do like the fact you are allowing the program to work with touch screen. Though I will most likely not use that feature due to not wanting any of the drunks at the wedding to touch any of my electronic equipment..LOL. As a thought for those that want zoom, find out if there is a 'hot key' for zooming in and out with your webcam (most offer this), then get yourself a Griffin Powermate ($30ish (US) on ebay), reasign the Powermate (turn right-left) to zoom in-out to your liking! This may be a bug(preview 3), but when I come out of screensaver with a touch screen, no matter where I touch the screen, the program starts to take pics. Ive tried this with 2 machines with the same result. 2nd machine = WinVista Ultimate, Duo-Core 2, 2.6ghz, 2mb RAM with ELO 15" Touchscreen. Also, how can one revert back to regular release without burning up one of the three activations? I will send a screenshot later this afternoon (Im in the USA in the Eastern time zone). What I have found to be the case is that when you touch outside of the left/right arrows; anywhere within the picture, the countdown begins for the picture. This happens regardless of coming out of screensaver or not. In a future release could there be a 'cancel' button for touch screens? 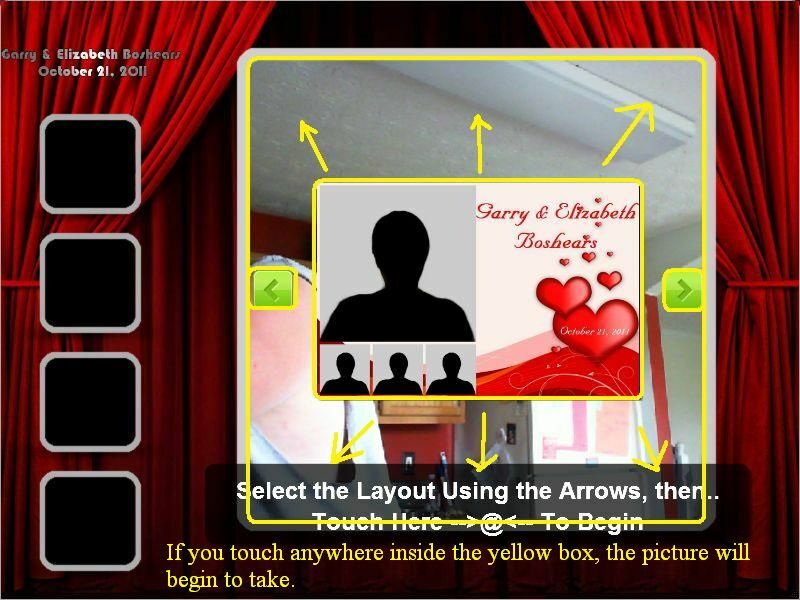 I really want to eliminate the need for a keyboard on the user side of the photobooth. any projection as when spark booth 3 will be available as public release? John Wu closed this discussion on 25 Sep, 2011 04:42 PM.